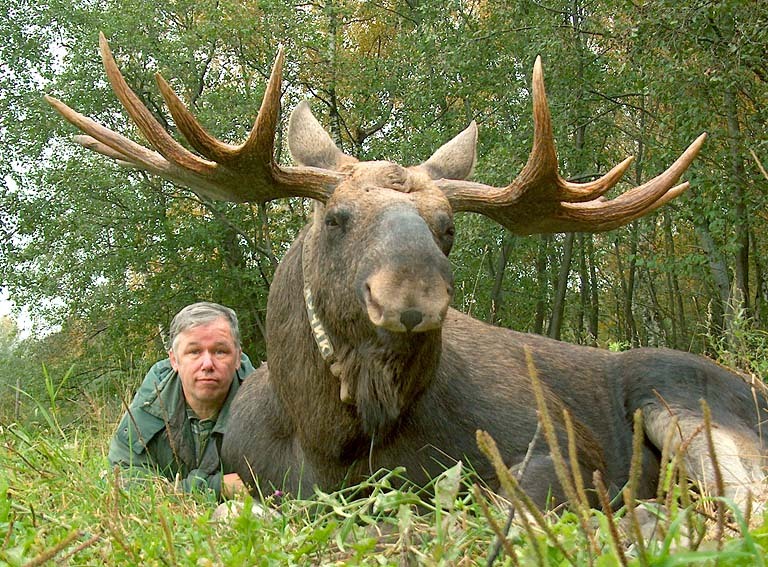 Welcome to this moose site and to the Kostroma (Sumarokovo) moose farm! If you came here only to find the way to the moose farm, go directly to «Guided tours» or «How to find the moose farm» sections. If you only want to view images, you may proceed to the «Gallery», but the illustrated text part has photographs, too. All my text and photographs are distributed freely: you may copy them and use for non-commercial purposes in any way except for hunting propaganda. Please add a link to this site if you use any part of it. If you love animals, read all through the site. If you became interested in a so-called «moose farming», please, start from the section «Don't torture animals!» Moose can't live a long life in captivity; they need some freedom: several months of freedom every year. Keeping moose in captivity round the year is a kind of abusive and cruel handling of them. – On the one hand, moose live in dependence on human. Sometimes fenced moose may be out of food if both tractors are in bad condition or drivers are on a drunk, but this is not a woe because fences are not too durable here. The animals can break them or jump over if necessary. Sometimes the farm director disimproves the moose confinement conditions to improve the conditions for visitors. The worst of it is that the animals can be sold to hunting ranches or zoos. As a rule, moose don't live out longer than 7 years in zoo cages. Finally, they can be killed out of mere freak of the farm director. Almost every director started his work on the farm with «culling». – On the other hand, a free ranging domestic moose can leave the farm if he or she wants to. Some of them migrated up to two hundred kilometers away and lived there as wild ones. Those who left on the farm, don't need to thrill and be afraid of stalking hunters. 36000 hectares of reserved area are guarded by gamekeepers from poaching, and no hunting is permitted on the area. Adult moose have few natural enemies. Only gnats disturb in the summertime, but the farm offers moose very good «dark» shelters. The farm has vets, and the calves survival rate is higher than in the natural conditions. Lifespan of domestic moose is up to 18-20 years which is hardly achievable in the nature. Moose here don't suffer from winter shortage of food: aspen bark and branches are available at the woodcut. Every day every moose gets a bucket or two of oatmeal. The farm joke is: our moose sold themselves for a bucket of oatmeal. See further details on this site. This Internet site is made and supported by Alexander Minaev, a senior scientific researcher working in the A.N.Severtzov Institute of Ecology and Evolution, Russian Academy of Sciences, Moscow, Russian Federation. All photographs are taken by me except where otherwise expressly indicated. I use a simple html-code. Please excuse me for «primitivism». The site design is ultimately simplified to improve load speed through Russian telephone wires and GPRS. Russian Internet beyond the borders of Moscow and some big cities is not very fast. The site structure is «linear», and you can look through it all and won't miss anything if press the right arrow in the bottom of every page. Please excuse me for poor English: English is not my native language. I use a word «moose» to avoid ambiguity, because English «elk» means Alces alces in Europe, but Cervus canadensis, wapiti in America. An Indian word «moose» means Alces alces everywhere. My personal e-mail addresses is moosefarmer@mail.ru . I try to check messages at least once a day. 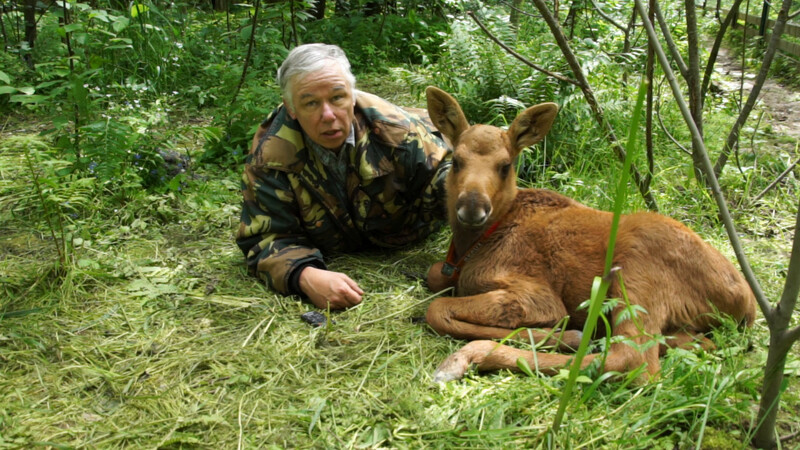 An author's film «Moose, a domestic animal. The Kostroma moose farm» is available (on DVD, 90 min., English and Russian versions). You will see almost all about moose life on the farm in winter, spring, summer and autumn. Visitors can buy DVD in the souvenir shop near the farm entrance. 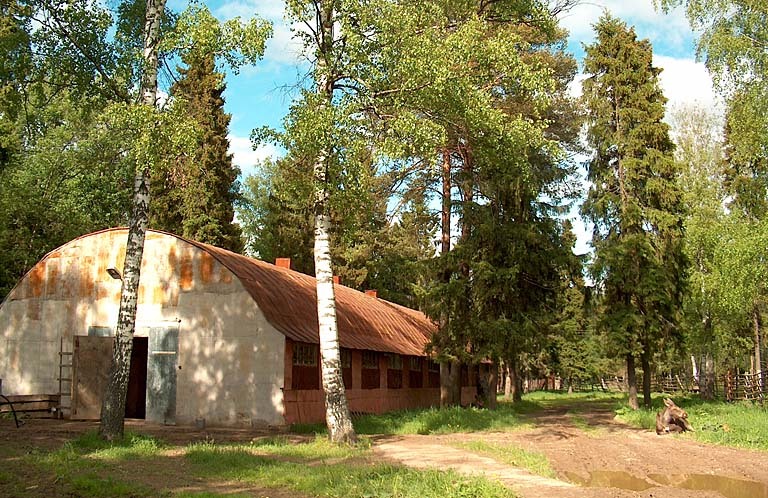 A new official site of the Sumarokovo farm appeared in the Internet at http://www.loseferma.ru. That site has no English version. I am not responsible for its content though some of my text and photographs are taken from this site. Other moose farms, parks, research centers, etc. Links.